I am officially gearing up for my next workshop and I think it’s finally time to tell you guys a little bit about it. 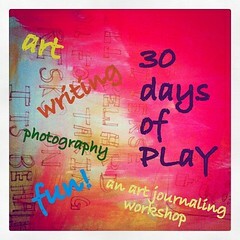 The workshop is called 30 Days of PLaY and will run April 1st through 30th. I have been planning this for a few months, and I’m a little sad it will be happening the same time as 21 Secrets, but I still want to continue with my original plan. Anyway, this workshop is just for fun, and will be super cheap. What is 30 Days of PLaY? 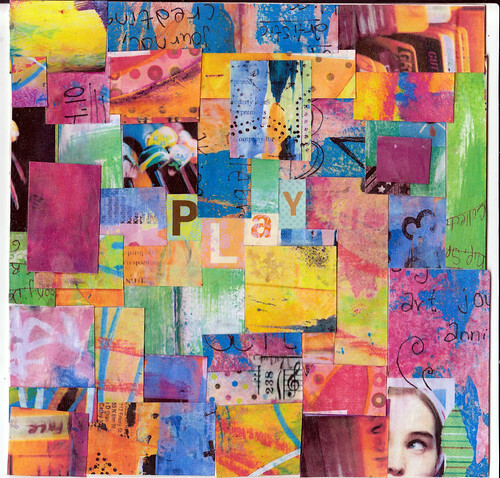 30 Days of PLaY is a month-long prompt-based workshop. I created this workshop to inspire people to go to their journals every day and create magic. I also want to go beyond just visual journaling to dabble in other forms of self-expression. Whether you’re an art journalist, a poet, a photographer, or just a big kid at heart–you’re going to love this workshop. During the month of April, I will post three prompts a day–one to get you itching to write, another to inspire you to express yourself visually, and one to add a little PlaY to your day. Yes, that means you will get 90 fun prompts! What do you mean by PLaY? 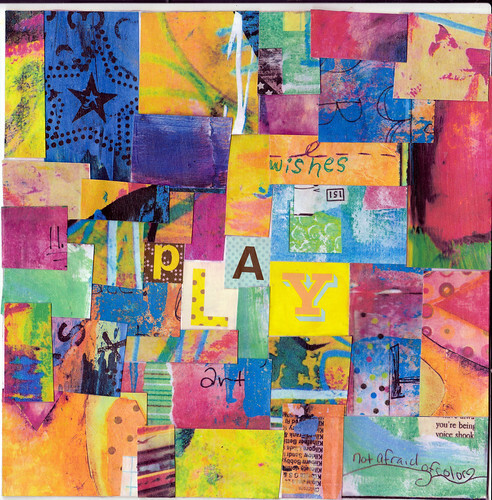 The PLaY Prompts are just what the sound like–little nudges to get you to add some fun and creativity to your day. Hopefully these prompts will have you seeking out your inner child and inviting her over to party. They are just simple ideas to get your imagination rolling. You don’t need anything fancy for this workshop–just use what you already have. At the bare minimum, you need an art journal, basic art journaling supplies, a notebook, a camera (even your cellphone camera will work), and most importantly, your imagination. What if April’s not a good month for me? Can I sign up later? Yes! Once the workshop is up, it’s not coming down. That means you can sign up whenever you like and you’ll always have access to the prompts once you do. How does free sound? Well, there is sort of a catch. The workshop is free once you join my Creative Sparks Network. Or joining the network is free once you pay for the workshop, however you want to look at it. Either way, you only have to pay $10 to get access to this awesome workshop! Yep, just $10 bucks and you get 90 amazing prompts and membership to a great new community. Okay, so what is the Creative Sparks Network? I’ve been toying with the idea of creating my own social network for a while so I’d have my own space to host my workshops. My ideas are all coming together now to form my own new space, Creative Sparks. Creative Sparks is a social network (like a Ning) that I created to bring together all sorts of creative types from across the universe. I am just getting started with the idea of my own social network, but I have so many ideas I want to try. In the future, there may be a book club, a sketching circle, a writer’s corner, and a photographer’s group. Basically, I want to take the idea of 30 Days of PLaY and expand it. Hopefully there will be a niche for everyone there. I even like the idea of letting other artist’s come in and take over for a while, sharing their knowledge and ideas. I’m just getting started with my network, but I really think it’s going to go far! Creative Sparks will open it’s doors on March 24, 2011. That will give everyone a week to get in, get acquainted, and get a feel for the place before the first workshop begins. So, what do you think? Are you excited? I am, but I’m also really nervous! I’d love to hear your thoughts on the workshop and network before I get started. Looking forward to having you as my student! This sounds *amazing* and really, really fun. Count me in, too! I love that there will be all kinds of prompts, and I love the idea of a social art network…can’t wait! Sounds just what I need,fun. Am going away for a while will definately sign up when I am back. Good luck for the 1 st.
cool! I look forward to having you join us!